Ok, after this I’m done blogging today. I’ve got two papers to review and a pile of other work. In the meantime Reuters finally reported the story. Of course it was within the context of a paper released by realclimate scientists which exaggerates the climate issues to policy makers as we expected from the emails. “We’re facing an effort by special interests who are trying to confuse the public,” said Richard Somerville, Distinguished Professor Emeritus at Scripps Institution of Oceanography and a lead author of the UN IPCC Fourth Assessment Report. There is one thing I know for absolute certainty, NO special interests are involved. Would you risk your 501C company on hackers for this? I would call it ignorant if I didn’t think it were simply a lie. Dissenters see action to slow global warming as “a threat,” he said. I have to say, I’m not a dissenter but I see the proposed action to stop global warming as a threat greater than Russia ever was. What these leftists are proposing is nothing less than the total destruction of free society couched in nice words. We therefore must agree. The scientists—Somerville, Michael Mann of Penn State and Eric Steig of University of Washington—were supposed to be discussing their new report, the Copenhagen Diagnosis, a dismal update of the UN IPCC’s 2007 climate data by 26 scientists from eight nations. This is a fun paragraph for me. I’m glad they spent some time discussing their advocacy rather than their agenda. I’ve had a few emails with Doc. Steig and am not sure he’s of the advocate group but it’s hard to imagine how he could be in the same room with Mann if he weren’t. Mann wouldn’t stand for it. People wouldn’t read the Air Vent if it weren’t about honesty. So I’ll be honest to Vice Chancellor of Research Trevor Davies — LIAR!! Michael Mann the continual creator of absolutely horrifically bad science had this to say. Hans Von Storch is one of my favorite climate scientists, simply due to VonStorch and Zorita 04. The paper had problems because they attempted to replicate a Mann paper and completely blew it — by doing it the right way. They didn’t cover anything up and addressed the issues head on – unlike Mann’s upside down proxies. Anyway, the working parts of the paper ends up showing the same results as my hockey stick posts above. I almost ran this post but it came in at just the right time that I had to drive to the folks house and it was difficult to get done. Anthony Watts picked it up though. What people need to understand – especially the blond headed media – this is standard. New Zeland Temperature – the original is not the same as the official. To the MEDIA:: This is the reason we want HadCRUT original data. _____This is the reason for the FOIA. __________This is the reason for the blocking of FOIA. I’ve decided to reproduce the Real Climate latest post in its entirety in an unmoderated fashion. It would seem valuable to have the ability to address the scientists in an open manner. Say anything except keep the language reasonable. The boys need to hear a little longer what we think after all they are movin’ on like nothing happened. I’ve added a bit to the bottom. haha. The ‘Copenhagen Diagnosis‘, a report by 26 scientists from around the world was released today. The report is intended as an update to the IPCC 2007 Working Group 1 report. Like the IPCC report, everything in the Copenhagen Diagnosis is from the peer-reviewed literature, so there is nothing really new. But the report summarizes and highlights those studies, published since the (2006) close-off date for the IPCC report, that the authors deemed most relevant to the negotiations in Copenhagen (COP15) next month. This report was written for policy-makers, stakeholders, the media and the broader public, and has been sent to each and every one of the COP15 negotiating teams throughout the world. The ice sheets are both losing mass (and hence contributing to sea level rise). This was not certain at the time of the IPCC report. Arctic sea ice has declined faster than projected by IPCC. Greenhouse gas concentrations have continued to track the upper bounds of IPCC projections. Observed global temperature changes remain entirely in accord with IPCC projections, i.e. an anthropogenic warming trend of about 0.2 ºC per decade with superimposed short-term natural variability. Sea level has risen more than 5 centimeters over the past 15 years, about 80% higher than IPCC projections from 2001. Perhaps most importantly, the report articulates a much clearer picture of what has to happen if the world wants to keep future warming within the reasonable threshold (2°C) that the European Union and the G8 nations have already agreed to in principle. The full report is available at www.copenhagendiagnosis.org. Three of us at RealClimate are co-authors so we can’t offer an independent review of the report here. We welcome discussion in the comments section though. But read the report first before commenting, please. Well the drive by media is getting a part of the story but we all know they cannot be counted on to figure anything out on their own. You wonder why circulation is down my friends, here is a great example. This scandal is the biggest thing to hit climate science ever, and the leftist media took several days to even begin covering it. Now they’re covering it incorrectly. At the same time the conservative side declares global warming has ended. What the media doesn’t know because they don’t read the climate blogs is that ‘HIDE THE DECLINE’ is not unusual. Let’s start with this point by Gavin Schmidt at Real Climate – a website exposed in these emails to be a global warmest advocacy group. Those authors have always recommend not using the post 1960 part of their reconstruction, and so while ‘hiding’ is probably a poor choice of words (since it is ‘hidden’ in plain sight), not using the data in the plot is completely appropriate, as is further research to understand why this happens. Now Gavin correctly points out the data’s decline is “HIDDEN IN PLAIN SIGHT”!!!. Right where everyone can see. He also points out that the ‘authors’ have always ‘recommended’ to hide the decline. This is absolutely correct as the original authors are Keith Briffa and Tim Osborn – featured heavily in the climate gate email and code. They have their own recommended ‘hide the decline’ quotes. This next quote is from Phil Jones email, Phil Jones was lead author of an entire chapter of the IPCC. I’ve just completed Mike’s Nature trick of adding in the real temps to each series for the last 20 years (ie from 1981 onwards) amd [sic] from1961 for Keith’s to hide the decline. Uses “corrected” MXD – but shouldn’t usually ; plot past 1960 because these will be artificially adjusted to look closer to the real temperatures. 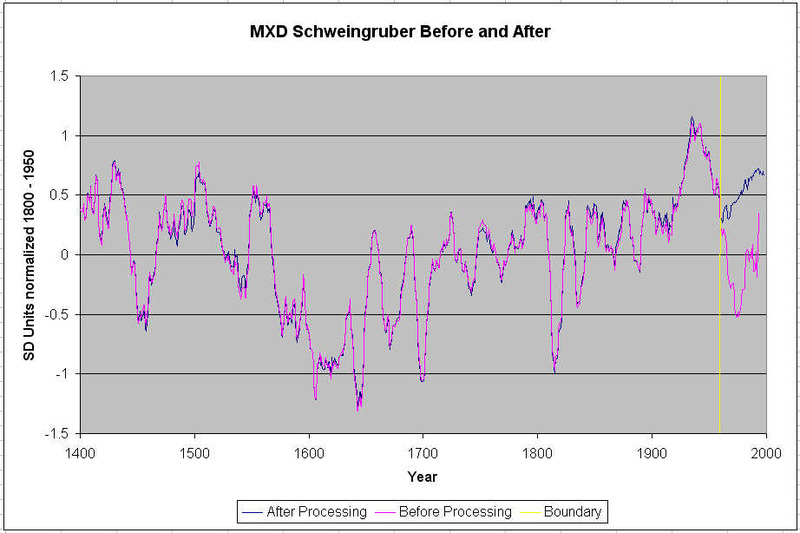 Because of the evidence for loss of temperature sensitivity after 1960 (1), MXD data were eliminated for the post-1960 interval. And in Gavin’s comment below at surreal climate – everyone knows about it as I also pointed out in my original post. As for the ‘decline’, it is well known that Keith Briffa’s maximum latewood tree ring density proxy diverges from the temperature records after 1960 (this is more commonly known as the “divergence problem”–see e.g. the recent discussion in this paper) and has been discussed in the literature since Briffa et al in Nature in 1998 (Nature, 391, 678-682). Gavin and the media need to understand that we also see in Phil Jones quote that the last 20 years of other data were replaced. What we have is bad science which is known to be bad by the original authors. Phil Jones was then caught in public making what appear to be false statements twice (once WRT deletion of FOIA emails and once below). Remember these are known issues yet this is how Phil replied to his ‘hide the decline’ email. This does NOT jive with Gavin Schmidt’s correct interpretation that everyone knows about this issue in paleoclimatology. So then the media should be asking, how unusual is it? Here is an email from “scientist” Mick Kelly which is every bit as bad as Phil Jones email. We’ll not be ignoring the impact of the recent emails but we shouldn’t let the antics of the true scientists hold back our pursuit of understanding. As a young man, history was as exciting as liver and onions, now it’s thoroughly enjoyable. Tony Brown, official Air Vent (and every other blog) historian, has done yet another well researched and analyzed post on some of the worlds oldest quality thermometers. Guest post by Tony Brown. Today we examine another temperature triplet linked by the Hudson river, drop in to see James Hansen and Gavin, visit a shanty town and pay our respects to John Lennon. In other words my usual eclectic mix of history, trivia, science and serious investigation. Figure 1 photo from New York Times of Mohonk. Oh my god this was tears funny. From Minnesotans for global warming and Watts up With That it’s like having a year of frustrated blogging in a small closet let off your chest. An excellent historic accounting of Willis Eschenbachs experience with FOIA- all in order with the behind the scenes emails. It’s well worth reading on Maurizio Morabito’s blog. Jones – depends on what the definition of is is. I don’t think adding more dishonesty on will help their case do you? You have to love the determination. In the business world, some of the biggest players in the fossil fuel economy – such as Rio Tinto, Shell and General Motors – have joined USCAP, the business partnership that is supporting efforts to get a legislation through Congress to cut greenhouse gas emissions. Does anyone really think she read the emails, looked at the code or has checked even a single climate paper? Here’s another quote thanks to WUWT link here. One thing I do different than other science blogs is point out some of the issues with very little political correctness. If ya’ keep it bottled up it will make your head explode. There is a subset of the emails dealing with paleo reconstructions that have very strong implications as to the quality of paleo science. A couple of reporters have taken the time now to contact me on my opinions on these emails. My opinions will come out over time but to start with I and others are very unhappy with Michael Mann’s 2008 hockey stick work which as I’ve said for over a year now is absolute rubbish that couldn’t get published in a college lab. It’s been one of the bane’s of this blogger that anyone with a technical background could possibly accept these techniques as reasonable. Links above. Here is a reply I was working on this morning to a very simple question. How did you get into this? I’m an Aeronautical engineer by training but work as an optical engineer. I got interested in climate science when I started wondering how bad global warming was going to be. I noticed the different temperature metrics were divergent and started wondering how come we can’t nail down temperatures better than that. After a few questions on that at RC well before the Air Vent, I started reading CA, RC and WUWT more regularly but never left comments. What really got me into blogging on climate issues was Mann08 which is yet another hockey stick. This happened a bit over a year ago so I’m not as experienced with these papers as McIntyre and some of his regulars. What was discussed on tAV and CA about Mann08 is very relevant to the climate discussion in these emails and particularly so to the Jones,”hide the decline” quote, the ousting of editors of GRL and several others. In particular, a post this post back in October 08 contained this graph – https://noconsensus.files.wordpress.com/2008/10/before-and-after.jpg and some explanation of the angst associated with the ‘hiding of the decline’ which in any reasonable context says exactly what it means. The out of context arguments put forth by scientists have no validity and are simply hopeful remarks such that those without the will to review the detail can wash it from their happy little heads. So from Gavin we have Turkey. I’ve had an amazing inrush of guest post requests recently. There are several which will be put up in the coming days. Ryan O, sent me a copy of this letter written to Andy Revkin’s recent article in the NYT. Wow. Exactly what we’ve been saying. Dr, Tim ball discussing the significance of the emails. Thanks to Anthony Watts again who is always on these things. Don’t miss this one. You have got to see this. I’ve looked at the comments in several code modules but he found the best one so far. Remember Phil Jones now famous denial of knowledge as to what he meant about ‘hiding the decline’ in this post. Check out this quote from the code – cudo’s to Steve Neil for digging it out. ; USUAL correlate FUNCTION ON THE RESIDUALS.